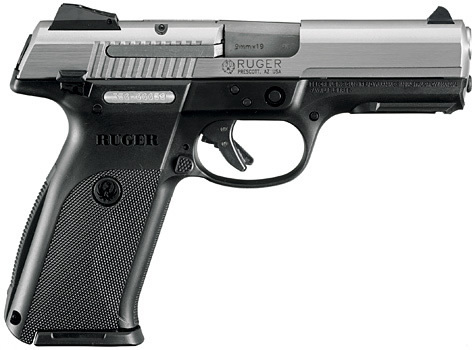 The Ruger SR9 is a semi-automatic striker fired polymer pistolÂ manufactured byÂ Sturm, Ruger & Company. The SR9 has been out for several years now, but somehow doesn’t seem to get as much attention as it should. I think this has a lot to do with the pistol’s history. Released in October of 2007, the original SR9 had a flawed trigger system. By April of 2008, Ruger had issued a recall for the SR9 because,Â under certain conditions, the SR9 could fire if dropped with the manual safety off and a round in the chamber (commonly referred to as the “drop test”). Ruger’s SR9 recall was free of charge and worked really well. I know, because I had one of the original SR9 pistols, and sent it to Ruger for a retrofitted trigger group. It was a simple matter of filling out a form, getting a box dropped off, packing it up, and sending it via prepaid shipping to Ruger. I actually didn’t mind this at all, as I was never happy with the trigger than came out of the box with the original SR9. The SR9 was the first large caliber striker fired pistol developed by Ruger, and as already mentioned, the trigger was an initial miss. However, after correcting the problem, the SR9 is a greatÂ pistol, and one that I have recommended to many people over the years. The SR9 trigger is pretty good out of the box, and even better once it gets broken in. It’s not the best out of the box striker trigger I’ve ever shot (that title is currently held by the excellent Walther PPQ), but a good trigger nonetheless. If you’ve ever shot a Glock, the SR9 feels very similar. I find the trigger pull to be fairly smooth with a clean break, and I can shoot the SR9 pretty well. For those who do not care for the SR9 trigger out of the box, Ghost Inc makes several trigger connectors that replace the factory connector. The SR9 grip has a very slim feel to it that I really like. It fits my hand well and is very ergonomic. I can get a really high grip on the pistol, which probably contributes to the low felt recoil. For a double stack pistol, the SR9 is very thin, and because of the contoured grip, the SR9 feels thinner that its 1.27″ maximum width suggests. The SR9 features adjustable 3-dot sights that are pretty decent out of the box. They are a bit on the small side, but I don’t have any trouble picking them up in shooting drills. Being on the small side, the sights are very precise for long distance shots. The Ruger SR9 is a full sized handgun, and as such, isn’t going to be a concealed carry gun for a lot of people. The SR9 is primarily a duty handgun that will be carried in an outside the waistband holster. Having said that, if you do wish to carry the SR9 concealed, check out a leather/Kydex hybrid holster like this Theis holster that we reviewed. The SR9 also makes a great home defense or car gun. I keep mine in my truck, along with a couple extra magazines, as a backup to my EDC handgun. The Monderno review team has two Ruger SR9’s. Between the two pistols, we have shot several thousand rounds through each pistol over the years, and have yet to have a single malfunction of any kind. As mentioned, I shoot the SR9 very well. Felt recoil is very mild, follow up shots are quick and easy, and the sights allow for good precision when shooting at a distance. There are few things that I don’t like about the SR9. First, is the loaded chamber indicator. This is a minor complaint of course, and I might be in the minority here, but for me it’s worthless. The second is the magazine disconnect. For those that do not know, a magazine disconnect is a safety mechanism that will prevent the gun from firing if the magazine is not properly seated.Â I understand why Ruger included these “features”, but I still don’t like them. Aside from those two minor complaints, the Ruger SR9 is a great pistol that is very underrated in my opinion. At under $400, it represents one of the best values on the market today. If you’re looking for a striker fired pistol that is affordable, reliable and accurate, make sure you look at the SR9. Interested in the Ruger SR9c? Check out our review here. I bought my SR9 1 yr ago. I started with factory 115 grain ammo & was getting a 4% failure to extract. I noticed the base of the cases were expanding an unusual amount so I handloaded with just slightly reduced loads. I have since fired more than 1000 115 grain Hornady hollow points with no malfuntions. For an old revolver guy the trigger is terrible. As the gun gets broken in, I am however, getting better with it. Did you send it back to Ruger? 4% failure to extract certainly isn’t normal… Thanks for stopping by! Brandon, I didn’t have to send it back. I figured out right away it was just an ammo problem. From what I have read about these types of pistols, you should not use them for self defense until you have shot at least 1000 rounds through them with out malfuntion. I especially like the safety on the SR9. It is very similar to the 22 cal Ruger Mark 1 that I have been shooting since 1968. I fired so many rounds through it that it went full automatic on me. I had to take it to a gunsmith and have it repaired. No, I don’t think the magazines from a P89 will fit the SR9. Does anybody know why you have to take the gun off safe to be able to load it? Many guns are made this way, but not all. You just need to familiarize yourself with the guns before you use them. When you pull the slide back & release it, the gun is cocked & ready to fire. The safety locks the slide in place. Without this lock the slide could possibly move back a slight amount when the gun is being holstered, rendering the gun unable to fire & useless in a self defense situation. The Ruger .22 standard rimfire functions the same way. My revolvers function the same way. When the double action revolver is cocked you cannot open the cylinder to reload. I checked the shotguns & rifles in my gun cabinet. The model 12 Winchester is locked when the gun is on safe but it has a release button ahead of the trigger guard. The Magazine on the SR9 can be removed & reloaded even though the pistol is locked with a round in the chamber. I’m sorry, that release button on the mod 12 is behind the trigger guard. I was just looking for a reason why they would force you to have the pistol off safe when loading. John, With the slide locked back, the proper way to load the SR9 is to insert a 17 round magazine. Release the slide, this puts a round in the chamber from the magazine. Then put the gun on safe,You can then take the 16 rd mag out & top it off to 17 rds again. I carry my SR9 with a rd in the chamber & the safety engaged so the white dot shows. With practice you can learn to draw the gun from its holster & sweep the safety off to the fire position with the thumb of your shooting hand as you bring the gun to bear. I practice this with an empty gun & empty mag. Ruger suggests you dry fire the gun anyway, in order to get used to the unusual trigger pull. Nice gun, I carry it concealed under my winter coat. I have the SR40, and put around a 1000 rounds through it with no failures at all. I was using the CCI Blazers, and Winchester white box target ammo. The only issues I don’t like is the 3 dot sights are way too small, and the guild rod for the slide is plastic, but you could buy stainless steel ones from Galloway precision. For those of you who do not like the manual safety & the mag disconnect on the Ruger, a man was just convicted here in MN when his little boy found his loaded pistol under his mattress & killed his little brother. One of the arguments used against him in court was the fact that his pistol did not have a working safety. Rod: Your example is a clear case of why you don’t alter you weapons in anyway that may effect operation, because a vindictive DA can ruin your life. Of course the man in MN made the ultimate mistake of leaving a loaded gun where his kids could find it. GUN SAFE FOLKS!!! I love the SR9. I’ve owned 3 so far and I’m currently looking to buy a new one. It has replaced my Glocks as my EDC carry pistol by and large. A highly underrated weapons platform IMO. Without a doubt, Highly underrated!